← LIVE! The O.J. Simpson Murder Trial Verdict! – White People Colored People Los Angeles a documentary 20 years later. Occupy LA activist decries the political punishment she has received from the “LAPD, LBPD, and LA Sheriff’s Department” following her time at Occupy L.A.. Melissa Balin claims LAPD used “torture…excessive force resulting in the unlawful termination of pregnancy” and the death of her unborn child. 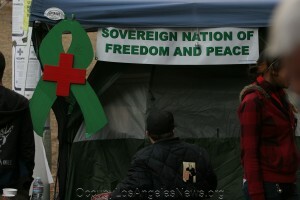 Occupy Los Angeles' Sovereign Nation of Freedom and Peace in 2011 at Los Angeles City Hall. To punish her for her Occupy LA participation, Balin now alleges that Los Angeles County governments and their policing agencies are out to get her. They have engaged in “torture and withholding of medical attention while [she was] pregnant and malicious prosecution of falsified charges resulting in the miscarriage of her first pregnancy” two days before Christmas in 2011 she recently wrote. Many who visited Occupy LA in 2011 could easily see Balin’s very tall tie-dyed white tipi tent high atop the south lawn. It is where she called home for weeks. The tent was located very close to Los Angeles City Hall’s south steps where most protest activities began and ended. 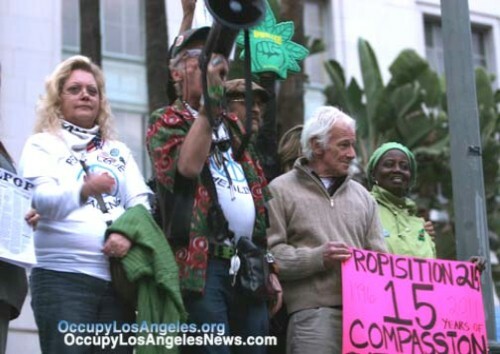 During Occupy LA’s stay at L.A. City Hall, Ms. Balin was highly outspoken for the legalization of marijuana. She is closely aligned with Dennis Peron. Peron is a long time marijuana activist and one time candidate for California Governor. Dennis Peron at Occupy LA 2011. At OLA there were times when Balin’s unscheduled acts of activism involved the use of highly disruptive tactics, including the use of her signature bullhorn, to get across her message. Some saw her as singularly focused. 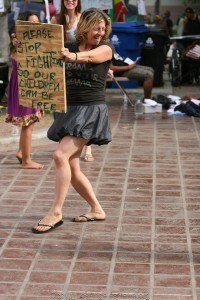 One of her action events did raise the ire of a few at Occupy LA. 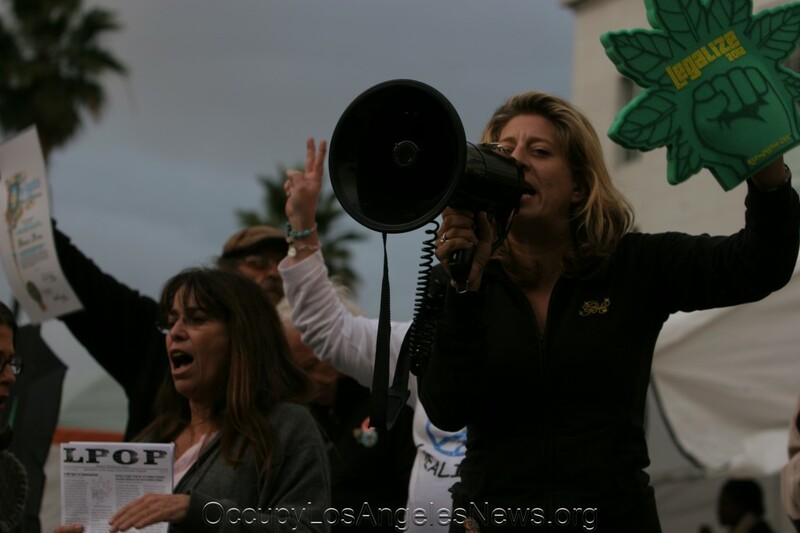 Her large number of supporters, many carrying “420″ signs, loudly clashed head-on with other nearby occupier activists who had organized discussion sessions with visiting speakers. But Melissa Balin is persistant and determined. ADVERTISEMENT:BarWhat? Pocket Gamer's "Best iPAD Games" list! Download. What is a Monell violation? Melissa Baling with sign "Stop fighting so our children can be free." Balin claims the City of Los Angeles and police actions resulted in the "miscarriage of her first pregnancy." Melissa Balin also asserts that Los Angeles County courts and two of its representatives Judge Henry Barela and Anthony Tahan, Ms. Balin’s court-appointed defense attorney, conspired to question her “competency to stand trial.” The men agreed there was a need for a mental health competency hearing that Ms. Balin should undergo and it should be held at a mental health court in Los Angeles. Balin’s case was heard by Judge Samantha Jessner. Melissa Balin still maintain the mental court hearings that she was forced to attend were “unconstitutional.” She wrote that she was ordered for mental evaluation and “involuntarily committed and force medicated from December 20, 2012 until June 16, 2013.” Balin said all this occurred because of “falsified medical and court documents.” She has since sued the City of Los Angeles for nine thousand dollars but settled for two hundred fifty dollars. Balin became a part of the Los Angeles County Jail’s mental health services system. And she believes it is solely because of her participation in Occupy Wall Street. While at OLA, Melissa Balin is seen here showing the marks on her arm she said were inflicted by police during one of her arrests. “Melissa Balin has been OCCUPIED” can be found here on StayOccupied. This article was written by Mitch Ward for OccupyLosAngelesNews.org and originally published June 28, 2014. This entry was posted in Cataloged Recent Posts, Occupy Local News, Occupy National News and tagged Melissa Balin, Sovereign Nation of Freedom and Peace. Bookmark the permalink. One Response to Occupy LA activist decries the political punishment she has received from the “LAPD, LBPD, and LA Sheriff’s Department” following her time at Occupy L.A.. Melissa Balin claims LAPD used “torture…excessive force resulting in the unlawful termination of pregnancy” and the death of her unborn child. On 6.29.2014 Melissa Balin wrote in response to this article: Thanks, Mitch! I appreciate you taking the time to share my Byzantine story. The only major correction I have is that I definitely did Not settle with the City- the court found in my favor in the case alleging that the City of LA wantonly destroyed our stuff (#LAM-13M00544), and only awarded me $250. The City tried to paint it as a settlement but it was recorded as a Judgement and there was even an Abstract filed with the County because the City had to be ordered by the Court to pay it. The check was never cashed so they can never say I settled. Thanks again!